The Narrows, in Zion National Park, is one of the most well known and visited slot canyon hikes in ZNP. The Narrows starts at the last stop on the Park shuttle bus, the Temple of Sinawava. You will get off the bus and follow the river walk trail for about a mile to where the side walk ends. Then, as the trail continues, it is basically up the Virgin River. So plan on getting wet, very wet. Sometimes you are up to your ankles and sometimes you are up to your waist wading through water, zig zagging from high shorelines to low shorelines. You may go as far up the river as you feel comfortable. Then, you will turn around and retrace your steps down river, making the hike as strenuous as you wish to make it. This hike is mostly seasonal and ultimately dependent on water levels. The beginning of the hiking season is dependent on runoff and water levels if they are low enough to send hikers through. For instance, you typically don’t need a backcountry permit to hike the Narrows, but if the water levels are above 120 cfs, the Narrows will be closed to hikers. If it is over 150 cfs, the wilderness desk will probably be issuing kayaking permits for the Narrows, not hiking permits. Even with open hiking allowed with a water flow of 100 cubic feet per second, it is still pretty difficult and dangerous. While a flow of around 50 cubic feet per second, this indicates a relatively easier and safer hike. Typically, the Narrows hiking seasons are Summer and Fall, where the water levels are pretty low and the water temperatures are pretty warm. We have hiked in both the spring and mid-summer and there are some huge differences we wanted to talk about here. We have visited Zion in Spring two different years 2017 and 2018. Water levels and run off levels were dramatically different. May 2017, they were issuing the last of the Kayaking permits for the Narrows. So we didn’t even think of hiking those rapids. March 2018, earlier in the year and a couple days before the Spring Break madness, the water levels were actually low enough to allow hikers and there was no rain in the forecast. So, we jumped on the opportunity. The water temperatures in late March were cold. There were less hikers than we saw in the summer, but there still a lot of hikers. About 98% of them were in rented Dry Suits and the Adidas waterproof Ankle supporting boots. Being thrifty vanlifers and having everything we need all the time, we avoided spending $55 on drysuits, as we threw on our 5/4 winter wetsuits, 5ml booties, and hiking poles. We were warm. It was perfect. To be honest, our foot and ankle muscles got quite the work out tho! If you have weak ankles, I would not recommend the booties, as the rocks are slippery and covered in algae and the booties offer no ankle support. Wear some hiking boots that offer ankle support. Others that are in our group did not have wetsuits and were not interested in paying $55 in rental gear to hike the Narrows. So they layered up and wore wool clothing items, hoping the wool would keep them warm even when wet. They toughed out the cold water temps for as long as possible, but we ended up turning around a little before Wall Street. Feeling like we didn’t “finish” the hike from turning around early, we needed to go back! In late May 2018, we crossed Utah again and made the mandatory Zion detour. We needed to hike the Narrows as far as we could go. This time it was a completely different experience. It was summer. There were heaps of people all along the river bank swimming, playing, picnicking, not just hiking. This is the spot to be in this park on a Hot summer day. The shadows created by the tall canyon walls keeps the canyon pretty mild. It is a great escape from the heat. This time around, we hiked in shorts, tank top, and hiking boots. We were sure to bring extra layers, because being wet and in the shadows can be pretty chilly no matter how hot of a day it is outside that canyon. The main difference between the two times of year was the air and water temperature. In the Spring, mostly the prepared and dry suit equipped braved the cold air and water temperatures. If we didn’t have a wetsuit, we would have been in a lot of layers, like our friends, just to stay warm from being soggy in the cooler air temps. In the Summer, it was a shady oasis for all looking to escape the heat. It was a very busy hike up stream with the groves of other tourists that varied in skill levels and ages. Flash floods can occur from storms miles away from the canyon, even if there is no rain predicted in the National Park. Make sure to check for potential weather in the area before you go hiking in any narrow canyon. Water levels can raise 12 feet within minutes, with no high ground to scramble to. Please take this seriously! Bring some shoes with ankle support. 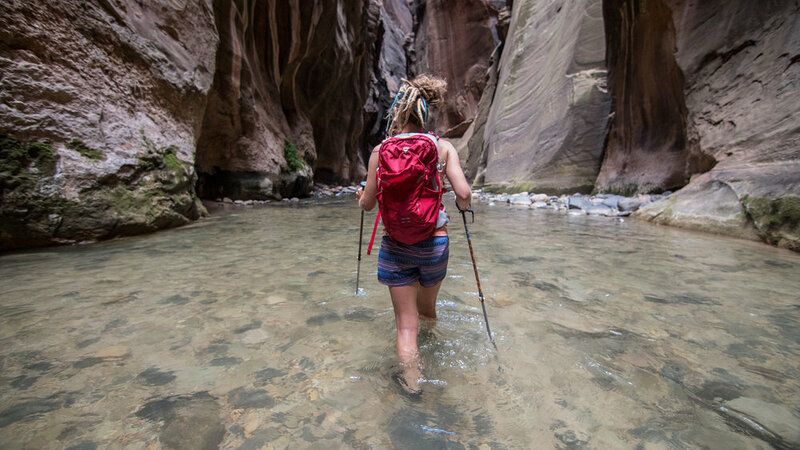 And use a walking stick or hiking poles to give yourself more points of contact while hiking upstream. Bring a headlamp. It gets dark in those canyon as the sun sets. To be on the safe side, make sure you carry an emergency light source, it could help you from spending a dark and unintended cold night in the canyon. If you don’t have a Dry Bag, this would be the time to get one for your electronics that you would like to bring that you do not want to get wet.